The Special N.N.V. Fan 120 PWM is the ideal candidate when looking for a quiet and effective PWM fan for a CPU cooler, chassis or even a radiator. Nanoxia's Special N.N.V fans feature a patented technology that makes it the world's first vibration-free PC fan by decoupling the two fan frames. The outer frame (grey) provides mounting points for the fan whether it be on the chassis or a CPU cooler. The inner fan frame (green) is decoupled with four plastic dampers (from the grey fan frame) and which contains the rotor and the fan motor. This means the vibrational noise emitted by the Special N.N.V. is virtually none existent! The motor of the fan receives its PWM signal via a 4-pin connection on the motherboard. The fan electronics evaluate the signal and temperature of the hardware and then regulates the speed of the fan automatically. The PWM control of the Special N.N.V. Fans features a very linear control range, so that speed changes are hardly noticable. The fan features FDB bearings which are very robust and long-lasting and the rotor and fan blades are optimally balanced. Which when added together guarantee a particularly long life span. The Nanoxia Special N.N.V. 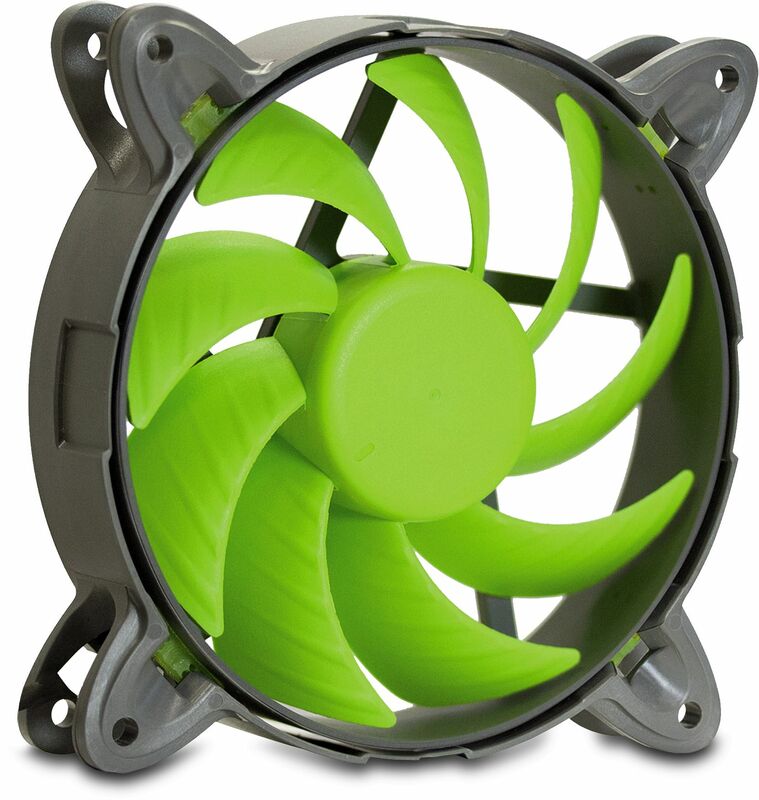 120 PWM fan rotates at 400 - 1650 RPM and therefore offers a very wide control range, providing a maximum airflow of up to 52.6 CFM and noise levels that do not exceed 24.6 dB(A).